Apple’s Newsstand has received plenty of analysis from the media industry press since it was first announced earlier this year, but now that it’s here, there’s a surprising factor in why it might be a success – its icon. Newsstand is a central hub for all your newspaper and magazine app subscriptions in iOS. Each title you subscribe to, and there are plenty of big names involved from the New York Times to National Geographic, shows up as a separate title in your virtual bookshelf of magazines. A store is available, letting you browse and subscribe to titles from one place. You can’t miss it: Unlike Apple’s bookstore, iBooks, Newsstand isn’t an optional download – it’s right there on the homescreen when you start up iOS 5. 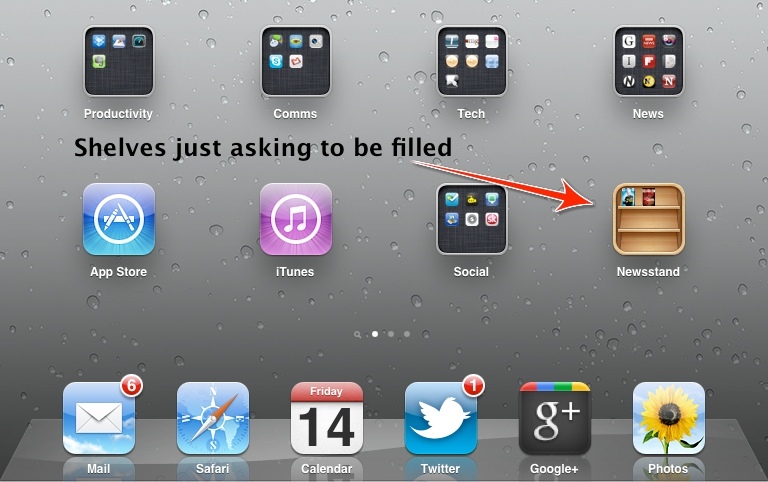 Every iOS 5 user knows about NewsStand. You can’t get rid of it – While you can move it to another menu page, the Newsstand icon can’t be deleted – it’s there for good. You can’t even move it into a folder because it is a folder itself – one with a customized design, but a folder nevertheless. Okay, there’s a little trick you can use to get it into a folder if you really want, but it will restart your phone if you try to open it while in a folder so it’s a bug, not a feature. Once you start using it, you want to use it more: If you haven’t subscribed to any publications through NewsStand yet, you won’t necessarily know about this, but each title you’re subscribed to is visible even when Newstand isn’t open – they appear on that tiny icon on your homescreen. The psychological effect here is important – seeing those magazines on the virtual shelf makes you want to open up the folder to have a read. Below, you can see the Newsstand icon as I see it on my iPad, with Wired and Wired UK sat on the shelf. You know what? That incomplete shelf makes me want to fill it up by subscribing to more titles. So, if Newsstand is a success, it could well be that humble little square icon that can take a lot of the credit.